Sell Huawei Watch Stainless Steel | How Much is My Huawei Watch Worth? Select the information above in order to receive an accurate quote for the Huawei Watch you want to sell. Click sell item if you agree with the price that is displayed. GreenBuyback purchases cell phones, tablets, and laptops at the highest prices in the industry! GreenBuyback pays cash for your old cell phones, tablets, and laptops. When you sell your cell phone, tablet, or laptop to GreenBuyback you will never have to pay shipping. GreenBuyback is dedicated to maximizing the cash back to our customers. Sell your Huawei Watch for cash today! 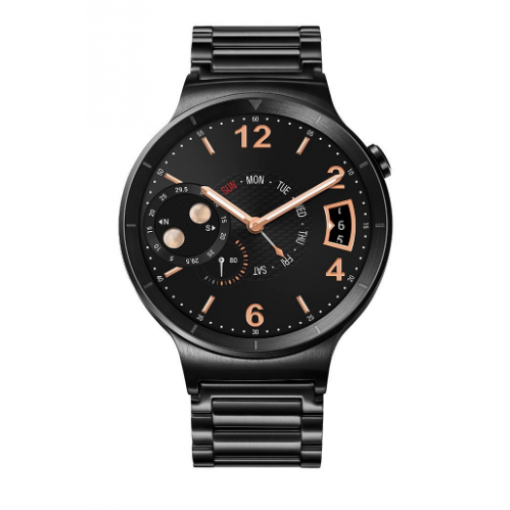 The Huawei Watch debuted in September 2015 and is a gorgeous smart-watch featuring wifi connectivity. The phone sports a sapphire crystal face and runs on Android Wear OS. The smart-watch has all the capabilities you could hope for: app support for your favorite social and fitness tracking platforms, email, text and phone call abilities, and it comes with an IP67 dust and water resistant rating. This watch is ready to go with you anywhere! GreenBuyback will buy your Huawei Watch in any condition, even broken! Simply head to GreenBuyback to get a quote, send your Huawei Watch in, and get cash quick! The watch is a smart black and and silver design with a formidable 300 mAh battery life (up to 1.5 days!) and runs on the all powerful Qualcomm processor. The watch also allows for up to 4GB of personal storage. Selling a Huawei Watch is so easy with GreenBuyback; send your Huawei Watch to GreenBuyback with free shipping and you’ll get cash sent to you fast!